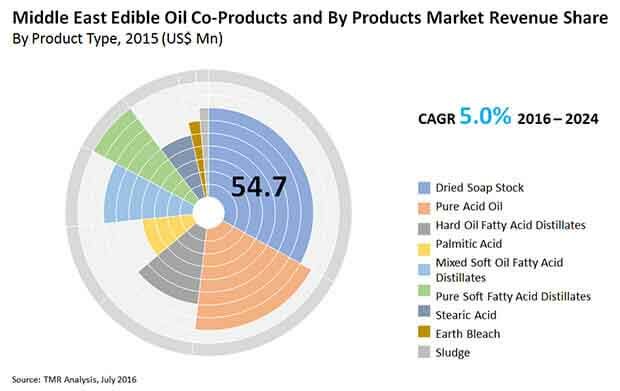 The Middle East edible oil co-products and by-products market is projected to witness lucrative growth in the coming years, as reported by Transparency Market Research (TMR). The market features a highly competitive business landscape, with vendors using aggressive strategies in order to gain traction in the industry. A rise in import and export of edible oil co-products and by-products is boosting growth opportunities for vendors in the market. Expansion to untapped regions is another leading strategy used by vendors in the Middle East edible oil co-products and by-products market. The players are engaged in promoting different product types across the Middle Eastern countries. Genome Specialities Fzc, A & B Chemical Corp., Iran Chemical Provider Co., Arabian Environmental Protection Co. and Chemipakhsh Iran Co. Ltd. are some of the prominent vendors operating in the Middle East co-products and by-products market. According to TMR’s predictions, the Middle East edible oil co-products and by-products market is expected to grow at a 4.20% CAGR in terms of volume over the forecast period 2016 to 2024. The market was estimated to be worth 388,944.3 tons in 2015 and is anticipated to reach 559,775.89 tons by 2024. Among the product segments, dried soap is projected to account for significant market revenue over the forecast period. This could be attributed to the expanding pool of middle class population in Egypt, bolstering the product segment. Based on geographical segmentation, Egypt is expected to gain prominence over the coming years. A major factor that drives market growth revenues in the forecast period is the growing oil and gas sector. Moreover, rising incomes from spreading out, increasing demand for flavors and new tastes, and growing demand from industries such as cosmetics and personal care, are some of the other reasons that the global demand for food and byproducts is expected to grow. However, an insufficient awareness of the benefits of edible oil products and by-products should hamper the growth of the target market in developing countries to some extent. Iran is a key fabricator and a growing number of petroleum mills for soaps and cleaning agents. The demand for these products is substantially higher in Turkey than in the other countries in the Middle East as a result of increased detergent and soap production and increased disposable incomes in the country. As an eco-friendly, natural ingredient biodegradable product, the demand is growing. Significant use of soaps and detergents in dried soap stocks is likely. Consumers are also strongly hygienic and focus on preventing viral and bacterial spread. Therefore there are high demands for Saudi soap and detergents and, in return, dried soap stock growth is expected to accelerate. Moreover, Egypt has significantly risen prices of raw feed. There is therefore a great need for dried soap stock to achieve proper efficiency of use and economical production as an alternative and cheap source of power in poultry diets. Furthermore, the introduction of new products with substantial quality and performance improvement resulted in factors such as increased private sector competition, consumer demand and good governance policy.